If energy-efficient windows are a must for the evolving home, then why haven’t they taken over the market yet? The answer is price. The Pacific Northwest National Laboratory in Richland, WA conducted a test on two windows installed in two prefabricated houses. One window has a triple-pane window, while the other has the usual aluminum frame. 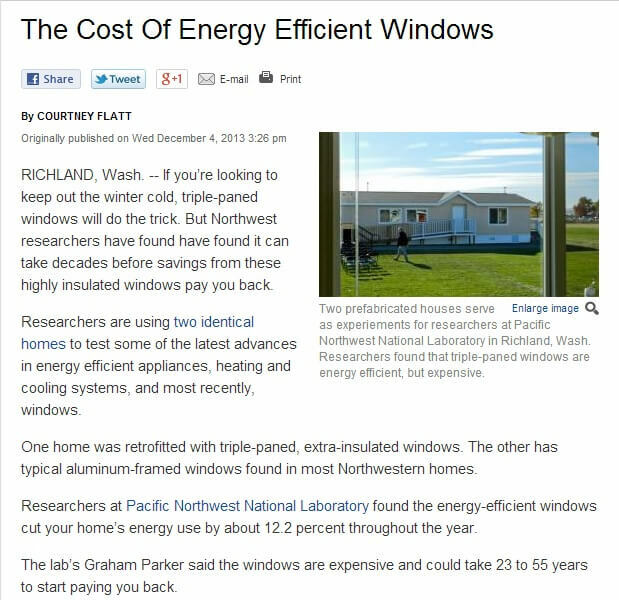 The result of the study showed that the first window generated more savings by more than 12 percent. That most certainly is impressive. However, the catch to it is that the cost of a triple-pane window can give your return on investment (ROI) not until 23 to 55 years later. Realistically speaking, that is a very long time to be waiting for ROI for an investment made on windows. Before you start stepping away from the promise of energy efficiency with windows in Detroit, however, reassess your priorities first. Does it make sense to install triple-pane windows when: (1) there are double-pane ones in the market; and (2) you’re changing windows of an existing home? The more panes there are in a window, the more energy-efficient it is. With an R-value of 8.3 and a U-factor of 0.12, triple-pane windows beat double-pane windows hands down (R-value of 3.3 and U-factor of 0.30). Then again, do you really need an R-value of 8.3 and a U-factor of 0.12? According to the 2009 International Energy Conservation Code (IECC), the US is split into eight climate zones. Detroit falls under Climate Zone 5 and 4 Marine. In this zone, the maximum U-factor for windows is set at 0.35. The minimum R-value for the zone is 13 (17 if over half of the insulation is on the wall). As walls are likely to provide most of the insulation due to their surface area, it may be okay to settle with a lower R-value for windows. The base R-value for a typical wall is 4.0. Extruded insulation has an R-value of 5.0 per inch of thickness. It should be fairly easy to meet the minimum R-value. Researchers said triple-pane windows make more sense when it’s a new house. Although the standards for energy efficiency have been getting smaller, there’s still time to consider double-pane replacement windows in Michigan. After all, windows offered by contractors such as Kroll Construction are only part of the system. Newer homes have to comply with modern standards unlike homes built prior to the standards’ implementation. By the next decade, the R-value for windows may increase to 5.0 (the current limit is at 3.0). Construction has to keep pace with the changing standards of energy efficiency. For existing homes, however, the change may not apply to them soon.